The U.S. drought, freak occurrence or a changing climate? The biggest U.S. drought in half a century has economists warning of higher food prices in the months ahead. But what if the problem goes deeper than that? Prepare for sticker shock. It's a warning consumers worldwide have been barraged with this summer, as the worst drought in half a century grips the U.S. and its Midwest farm belt. Analysts predict those devastated crops will contribute to higher food prices in the months ahead. But the shock might not be limited to our grocery bills. The weather conditions that led to this summer's unusually hot weather in the belly of the continent forebode potentially far more dangerous climatic consequences down the road, climatologists are saying. And if history is any kind of teacher, droughts and their resulting impact on the food chain are also important triggers of social unrest. The U.S. Federal Department of Agriculture Drought Map for Aug. 21, 2012. 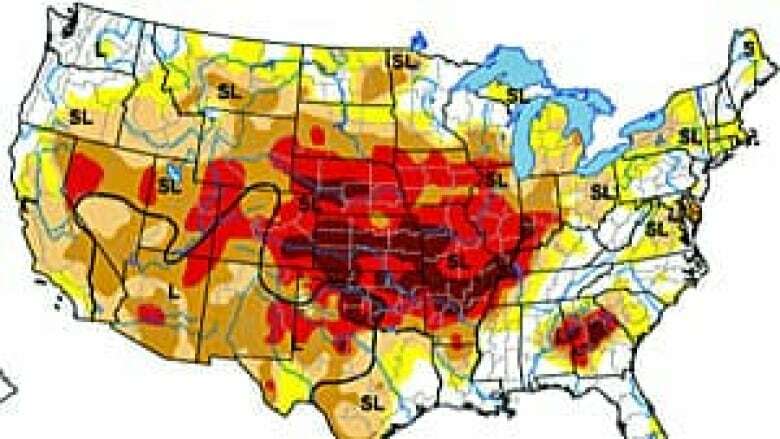 The coloured areas range from abnormally dry (yellow) to extreme and exceptional drought (red and dark brown). When the prices of rice, corn, and wheat spiked in 2007-2008, food riots broke out in more than two dozen countries across Africa, Latin America and the Middle East. The World Bank estimates the crisis pushed at least 130 million people into poverty in 2008 alone. The drought that overwhelmed Russia in 2010, when it froze its grain exports, sparked another hike in food prices across those regions and would contribute to a wave of revolutions in Egypt, Jordan, and Sudan that today we refer to as the Arab Spring. It's not a new phenomenon. Food shortages were also the precipitator of the French Revolution. It broke out on the day bread prices rose 89 per cent in Paris, and revolutionary French governments were careful to keep bread cheap post-1789. Today, the social and political implications of rising food prices are a year-to-year challenge. "We've been predicting since 2006 that, basically, the period of cheap food is over," says Abdolreza Abbassian, senior economist and grain expert at the UN'S Food and Agriculture Organization. Next year's price jump, estimated at between three and 4.5 per cent in the U.S. and Canada (only a portion of it related to this summer's drought), may well be the start of a larger escalation. This summer, record-breaking temperatures threw an estimated 62 per cent of America's farms into moderate drought or worse, according to the U.S. Department of Agriculture. Nine of this planet's 10 hottest years on record have occurred since 2000. The last month that was below the average global land temperature of the 20th century was in February 1985. The U.S. National Snow and Ice Centre says the Arctic ice cap is on track for a record-breaking summer melt session. Many experts estimate the Arctic ice cap will disappear within 20 to 30 years. According to NASA satellites, nearly 97 per cent of the surface of Greenland's ice sheet thawed in July. In an average summer, only about half of it shows any melting. 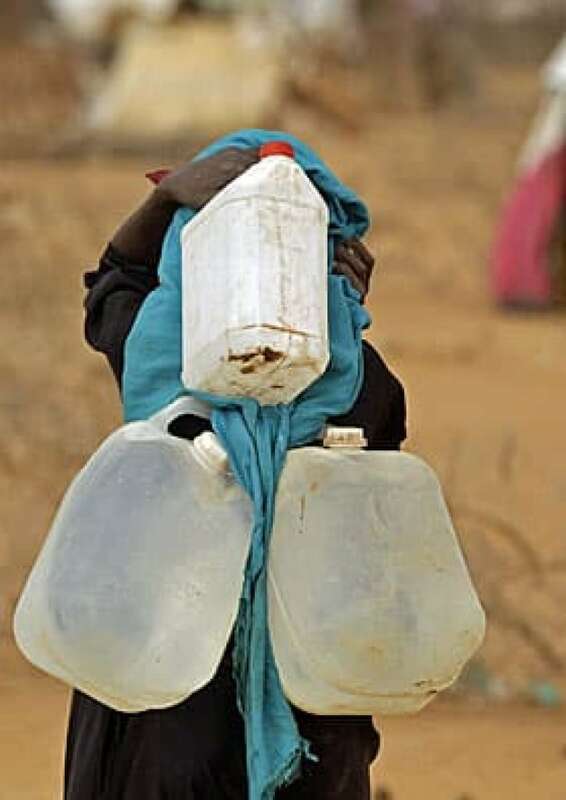 In Kenya, police records show a marked increase in water theft from homes and community wells, some resulting in death. 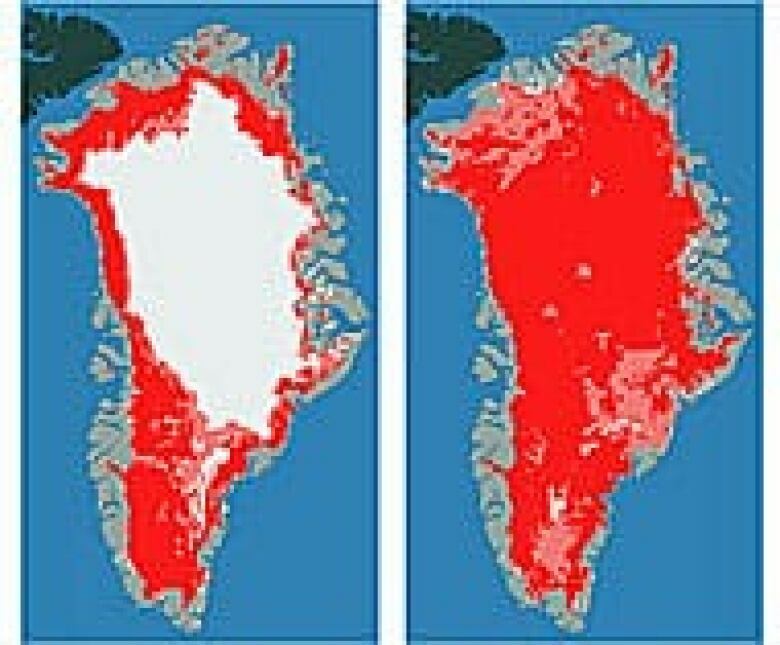 NASA satellite photos from July 8 (left) to July 12 (right) show the extent and rapidity over four days of ice melt, the dark pink, on Greenland's ice sheet in the summer of 2012. 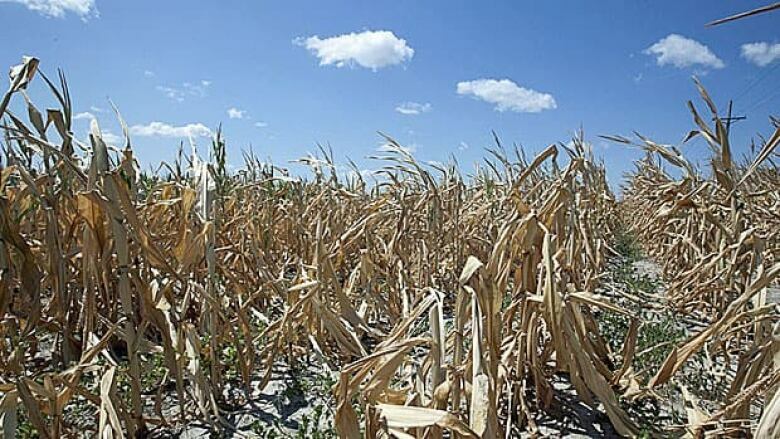 Moreover, "we really went into a drought situation quite rapidly," says Brian Fuchs, climatologist at the U.S. National Drought Mitigation Centre in Lincoln, Nebraska. "We typically don't see drought intensify like we did this year." The U.S. corn crop for 2012-13 is now expected to reach only 10.8 billion bushels, the lowest output in 17 years, and the impact of this reduction will ripple across the globe. If this turns out to be a one-time ripple, the problems won't be so bad. When it comes to feeding the planet, continuing bumper rice crops in Thailand in particular are keeping a global food crisis at bay, says the FAO's Abbassian. But there are many who suggest this summer's weather conditions are merely a precursor of worse upheaval to come. For example, a study published this month in the journal Nature Climate Change predicts the U.S. will suffer a series of severe droughts in the next two decades and some experts' warnings get even gloomier. NASA's top climate scientist James Hansen, sometimes referred to as the "godfather of global warming," says that, statistically, what's happening is not random, but pure and inevitable climate change. His research, published this month in the Proceedings of the National Academy of Science, finds that the likelihood of these latest temperatures occurring between the 1950s and the 1980s was rarer than 1 in 300. Today, given the meteorological changes that have developed since, the odds are closer to 1 in 10. At this juncture, it is not just higher food prices that could lead to social instability. The world's supply of fresh, unfrozen groundwater is running low as well. According to a study published in the journal Nature this month, about 1.7 billion people rely on underground aquifers that are overexploited and, once dried up, would take thousands of years to refill. One of the authors of the study, hydrogeologist Tom Gleeson of McGill University in Montreal, has been studying groundwater for 10 years. "When I saw how large the groundwater footprint was in the number of aquifers that are important for agriculture in Asia and North America, that was the most startling to me," he says. "If droughts continue, groundwater will be affected. The source of it is precipitation. If it's not raining, there's no source." The giant Ogallala aquifer in the U.S. is a case in point. Running under eight states from Nebraska to Texas, the aquifer is the country's most important. Nearly 27 per cent of America's irrigated farmland depends on it and it has now suffered its third largest decline on record, according to the local conservation district. Research from the University of Texas estimates some parts of the Ogallala Aquifer may be dry within the next 20 years. The problem is worse in more precarious regions, Gleeson says. Of the 783 aquifers studied by his team, the Upper Ganges aquifer in northern India shows the greatest overuse. It would need 54 times as much rain as it currently gets to sustain itself at the existing rate of use. At the same time, the region is adding an extra 25 million people a year. At the end of the month, U.S. and French officials will decide whether to organize a meeting of the Group of 20 officials who have been designated to discuss the impact of growing food prices. It would be the first gathering of the G20's Rapid Response Forum, a body created last year to "promote early discussion among decision-makers about abnormal market conditions, with the aim of avoiding unilateral action." But discussion alone likely won't temper Mother Nature's mercurial ways. And in the end, the problem may turn out to be quite a bit larger than just abnormal market conditions.